Review from Peter of the U.K.
We had friends coming to visit Sitges who wanted to do something a bit different. 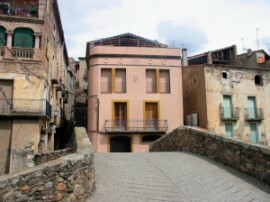 I had met Nicole socially and she had mentioned Niso Winetours, so I suggested a two day trip to Priorat to my friends. They thought it was a great idea as long as an itinerary could be designed that suited us all. This was not an easy task as in our group of 4 we had two who knew quite a lot about wine, one who knew a tiny bit and one who doesn’t drink and was more interested in seeing the sites. Nicole knew immediately what would suit us and came up with what looked like a tremendous itinerary so we booked our adventure with Niso. Our tour included the wineries of Vall Llach, ….. and Capafons Osso in Priorat and which were all fascinating in their own ways. I will never forget the first time I tasted Vall Llach or being driven around the vineyards by Sr Capafons while he explained about his belief that wildlife should be allowed to roam on his land as this adds magic and that he plants herbs to flavour to his soil and therefore his wines. I think the highlight of this part of the tour was standing at the top of a hill on the Capafons Osso land on a beautiful September day. I remember remarking that life doesn’t get much better as we looked out over the vineyards, picking and eating almonds from a tree. We ate at wonderful restaurants on both days where as well as tremendous food, we were introduced to some additional Priorat wines. Overnight we stayed in Porrera in a beautiful villa where the owners took great care of us and made a spectacular breakfast. Nicole also took us to the ruined monastery of Scala Dei and explained the history and made the place come alive for us. Our final stop was to the move to the Penedes region and visit the modern winery of Torello where Krypta Cava is made. After the older style wineries of Priorat it was fascinating to see how a larger (but still niche) producer made Cava. The winery is stunning to tour and the tastings take place in a very stylish room. Nicole explained (in conjunction with our guides) the different geologies and grape varieties of each winery and how this affects the taste and feel of each wine. The way Nicole involved us in the tour sparked an interest in the subject that we didn’t know we had, so as well as enjoying ourselves tremendously we all learned something that will stay with us. At each winery we were treated like family and made to feel really comfortable. Nothing was too much trouble. In summary, I would highly recommend Niso Winetours. Nicole understood what we wanted to achieve from the tour and made every minute enjoyable and also educational- plus we got to sample some fantastic wines which we now have cases of at home in Spain and look out for on winelists wherever we are on our travels.